Confirmed compatible with Project CARS, Project CARS 2, F1 2017 and F1 2018 on PS4. Confirmed compatible with Project CARS 2 on XBOX One. 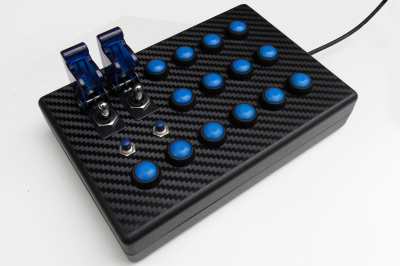 Button Box for the Playstation 4 and XBOX One. This range of boxes comes with three colour options, 'Playstation Blue', Red on Black or the Black on Black carbon 'stealth' version. This box featutrs two Momentary toggle switches, two 7mm push to make switches and fourteen 14mm push to make switches.. The PS4/XBOX will recognise this device as a USB keyboard so there is absolutely no setup, just plug it in and you are good to go. This box will work with any game that has 'in game' USB Keyboard support. 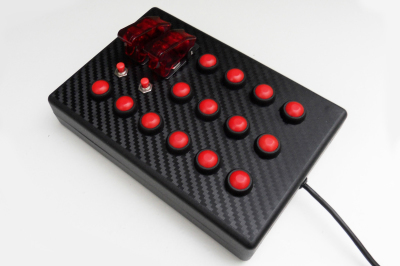 Button Box for the Playstation 4. Ever since we bought out the 'Pro' range for the PC we have been asked to produce a similar console compatible box. The original PS4 compatible range was designed for Project CARS and with Project CARS 2 now on sale it seems like a good time to update the range. 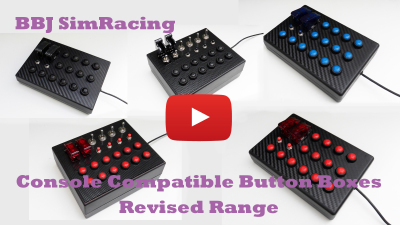 BBJ SimRacing 'Pro' Series Button Box. Features 2x 12mm momentary toggle switches with missile style safety covers, 4x 12mm 2-way momentary toggle switches, 4x 7mm push to make switches and 12x 14mm push to make switches. 26 total functions, all switches rated for genuine automotive use. Heavy duty ABS case, and a high gloss solid ABS fascia (a much more resilient finish than vinyl). Underside of box has 4 threaded mounting points that will accept M4 bolts. Box has a built in 6ft USB lead and is completely plug and play. USB powered so no power supply or batteries required. This version has red switches and knobs. For more detailed information and ideas on the use of these boxes please take the time to view the videos on this page. Please visit our shop to see colour options and the rest of our Button Box range. Will this box work with PC? Yes, this box is based around a keyboard encoder so your PC will see it as a USB wired keyboard. If your game/sim allows functions to be mapped to keyboard keys you will be able to map functions to this button box. In fact for some older PC Games/sims this may be a better choice than a Game Controller based device. Will this box work with xBox One? Project CARS 2 now has in game keyboard support on the XBOX One. We are not aware of any other XBOX games that have this feature but surely more will follow..